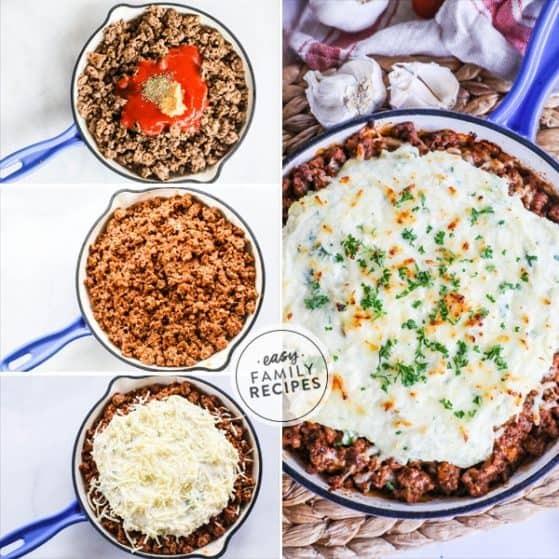 This cheesy Taco Skillet Dinner recipe is the ultimate crowd pleaser! 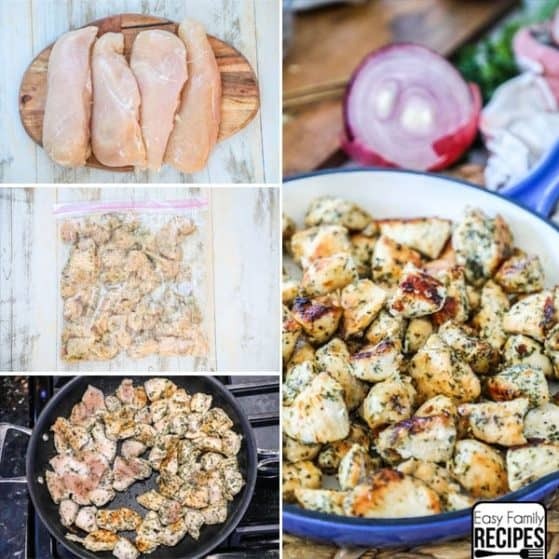 It is super easy to make using just one skillet and a handful of ingredients. Plus, it has all the flavors you love in tacos, made easy in just one dish. 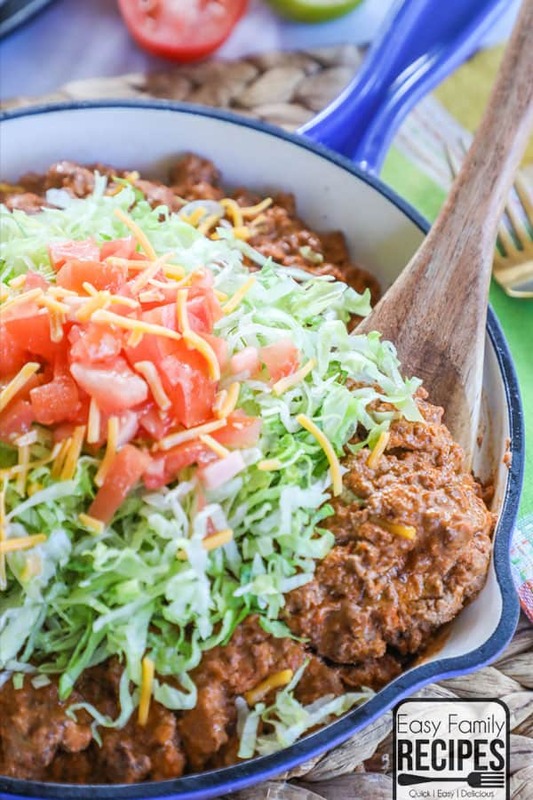 Perfect for busy weeknights or feeding a crowd, this classic beef taco skillet dinner has made it to our regular dinner rotation. Not only is this skillet super delicious, but as a bonus, it is also gluten free, low carb and friendly for the keto diet! 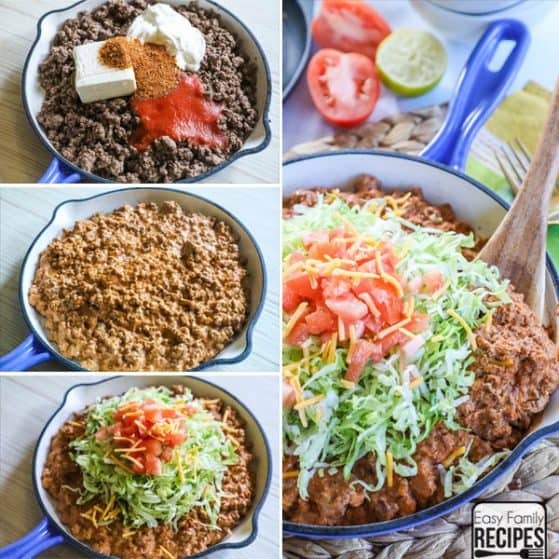 This Taco Skillet Dinner recipe is one that is perfect for the busiest of weeknights. It comes together quickly and since it all cooks in just one skillet, it doesn’t leave a huge mess to clean up afterwards. Who has time for big messes on a weeknight?! This recipe is one of those super yummy, brings back all the memories of the tacos I have eaten through life kinda dinners. It resembles a classic taco with the shredded lettuce and tomato, classic taco seasoning, but is given a life of it’s own by bulking it up with sauce and two delicious kinds of cheese. 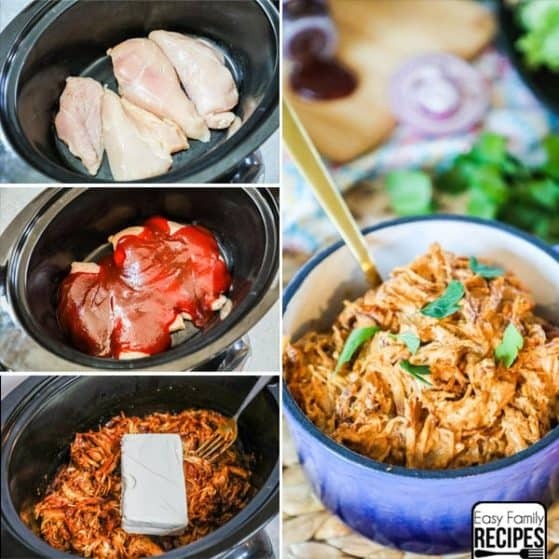 One of the things I love most about this recipe though, is that it is super family friendly and versatile to accommodate for different preferences and needs. My kids LOVE this dinner and can devour this in 2.5 minutes flat. They will eat it with chips or taco style in a tortilla. I prefer to keep it lighter and low carb by eating it in a bowl, and it is perfectly hardy and filling just like that. I have lots more serving suggestions below too, if you want more ideas! Delicious + Family Friendly + Little Clean up + Few Everyday Ingredients = Winning Dinner Recipe in my house! With chips- Serve this with corn chips, or right on top of a plate of them! Mexican Street Corn Casserole– This one is a reader favorite! Beans- Serve with a side of refried or black beans or pile the beans right in the bowl with a scoop of the taco skillet. Cornbread– You can even make cornbread ahead and keep it in the freezer to heat up for the busiest nights! Cauliflower rice- make plain or Mexican cauliflower rice and serve on the side or right on top. Zucchini chips or Kale chips – It isn’t a tortilla chip but the next best thing! Bell Peppers- Cut up sweet bell peppers, mini or regular sized, and use it for dipping and scooping this yummy taco skillet to get that satisfying crunch. Shredded cabbage- shred up green or purple cabbage and mix it with the shredded lettuce on top of this to give it more of a hearty salad feel. Zoodles- Sauté some zucchini noodles and serve this right on top. 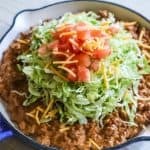 Low carb taco shell– If you want to eat this skillet taco style without the carbs, just whip up a batch of these! I hope you found some dinner time inspiration here! You can pair the Taco Skillet Dinner with one of these, or pick a few! And if you have another way you serve this that you love, please share it with me, and all of our readers in the comments below so we can give it a try! 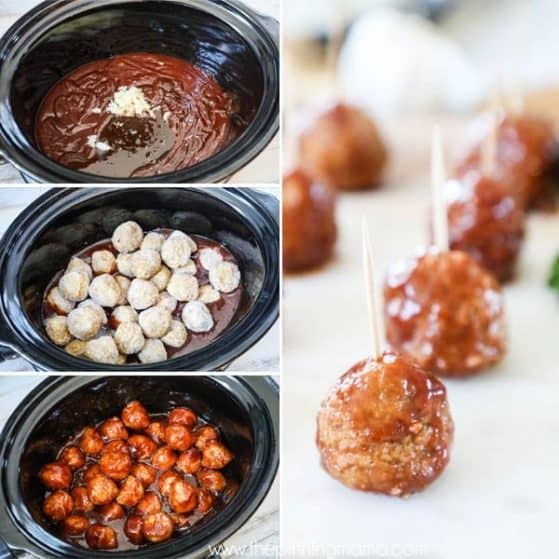 This recipe is super simple and perfect for busy nights! I am going to walk you through some of my pointers on making the recipe here, but make sure and scroll down to the bottom of this page for the FULL recipe card. To start, make sure that you pick a large skillet. This recipe will cook more quickly and create less mess if you have plenty of room in your skillet to work. Brown the ground beef in your skillet, then drain any grease. 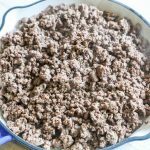 I like to use a lean ground beef so I am getting more good meat and less fat when cooked, but any ground beef from the store will work. Here I used 93% lean. Once the grease is drained return the skillet to the stove and turn back to medium heat. Add the cheese, sour cream, tomato sauce, and taco seasoning. Stir this into the meet and continue to cook until the cheese is melted and everything is combined. Word of caution: you can substitute light cream cheese but do not use fat free. It does not have the same melting properties and will not work well in this dish. When everything is combined, top with shredded lettuce, diced tomatoes, and cheddar cheese to finish! If you are not going to serve immediately, wait until serving time to top with lettuce and tomatoes to keep it freshest and avoid the lettuce from wilting with the heat. Also, if you love toppings feel free to go crazy with any you like! We do everything from the basics, to jalapeños, guacamole, ranch dressing, different kinds of salsas and more! 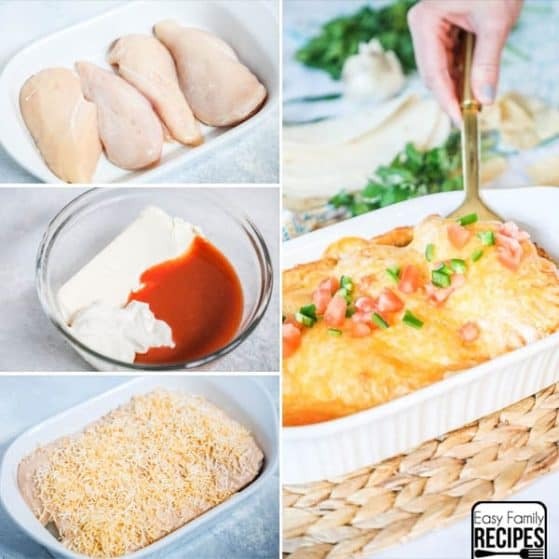 If you are a cheese lover you can also make this even cheesier by adding cheddar into the meat mixture on step 2, or put extra cheddar over the meat mixture before topping with lettuce and tomato and letting it melt from the heat of the skillet. I always recommend making the recipe as written, but if you have questions, or need to substitute, here are some of the things to use or avoid. I recommend you use shredded iceberg lettuce for the topping because it is what you will find on traditional tacos so it gives that taste and feel of a taco. You can buy a head of iceberg and shred it, or you can even buy it pre-shredded near the salad mixes. That is what I used here to make it simple! Any lettuce will work to top this skillet if needed. Homemade taco seasoning really adds something special to this dish. If you are gluten free or low carb, I absolutely recommend that you use this homemade seasoning to comply with your dietary needs. If you aren’t either of those and want to make this dish quicker, you can use pre-packed or store bought taco seasoning in lieu of homemade. Use light cream cheese. Do not use fat free because it will not melt in the same way. If you have leftovers, no need to repeat eating them the same way! 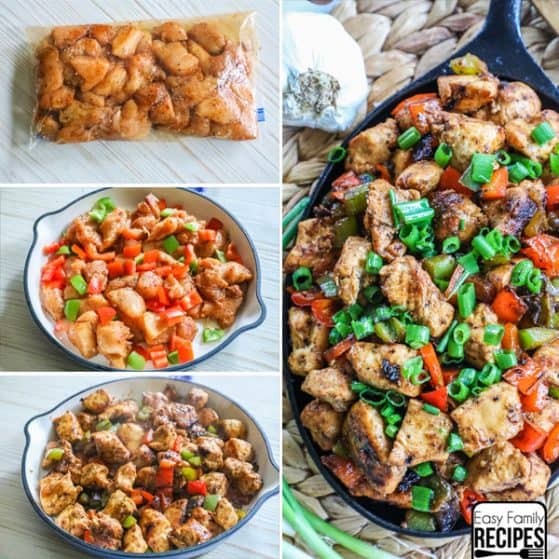 Here are several ways to use the leftovers of your Taco Skillet and make them into a completely new meal! Make sure as mentioned above, to remove the lettuce, tomato, and other fresh toppings before storing or reheating this dish. Taco Stuffed Baked Potatoes– Stuff this creamy taco meat into a perfectly baked potato, then top with shredded lettuce, pico de gallo and sour cream! Taco Stuffed Shells- Cook pasta shells, per package directions, and then stuff them with leftover taco meat. Cover with enchilada sauce or salsa, and sprinkle with cheddar cheese. Bake at 350 until heated through. Serve as is, or topped with sour cream and pico de gallo. Nachos with Cheesy Taco Meat– FRIDAY FAVORITE! Spread a layer of tortilla chips over a cookie sheet. Dollop taco meat evenly over chips. Add your choice of pinto beans, corn, chopped bell pepper, and/or jalapeño slices, then cover with cheese. Bake at 425˚F until the cheese is melted and the meat is heated through. Taco Stuffed Peppers– Cut bell peppers in half. Remove the stems, ribs, and seeds and rinse. Place the peppers cut side up in a casserole dish with 1 cup of water or chicken broth in the bottom. Fill each pepper half with taco meat, then top with a spoonful of salsa and a sprinkle of cheese. Bake at 350˚F covered with aluminum foil for 35-45 minutes or until the peppers are tender. Taco Rice/Cauli Rice bowls– Fill a bowl with rice, cauliflower rice, or your favorite grain. Place a scoop of the taco meat on top. 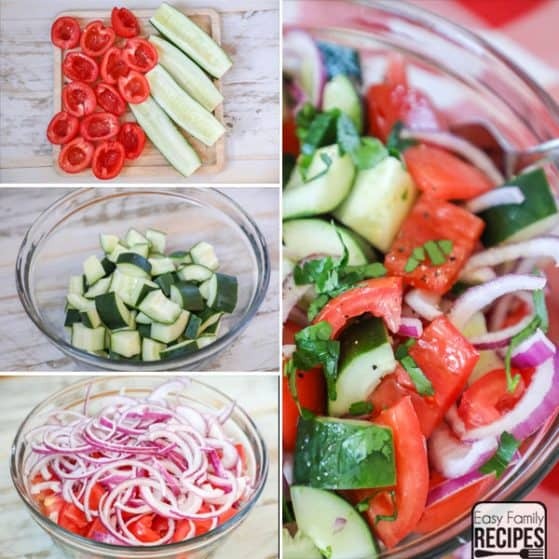 Add your favorite veggies such as pico de gallo, avocado, fresh tomato, chopped jalapeno, cabbage, lettuce, cilantro, bell peppers, etc. Eat as is, or mix with lime juice and a drizzle of olive oil. Taco Salad– Nothing is better than a classic taco salad, and these leftovers make a great one. 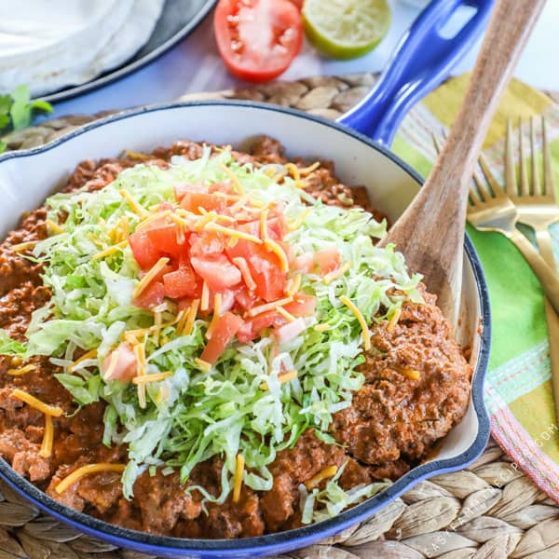 Top your favorite lettuce or greens with this taco meat, plus your choice of salsa, guacamole, corn, beans, tortilla chips, sour cream, or pico de gallo. I love to drizzle this salad with homemade ranch dressing! Taco Mac & Cheese – Make up a batch of your favorite mac & cheese (kraft or homemade – I won’t judge!) then stir in this leftover taco skillet with the cheese for a hearty twist! 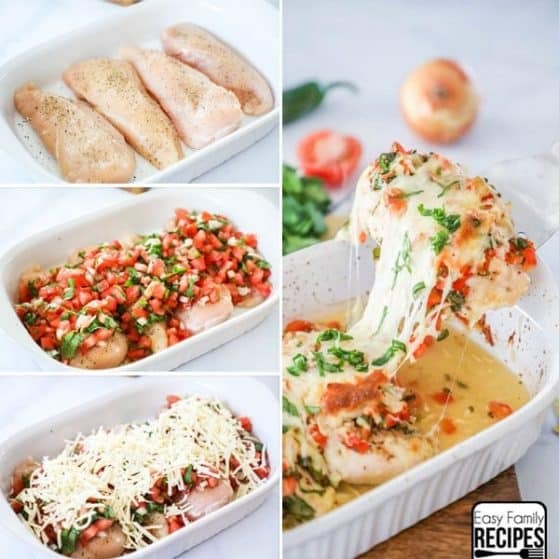 Skillet Ranch Chicken – My #1 go to recipe on busy nights! 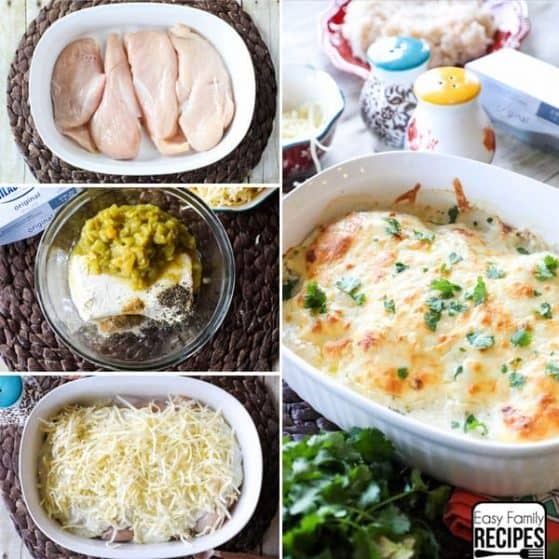 Bacon Ranch Chicken– One dish! This Taco Skillet Dinner is perfect for a busy weeknight since you make it in just one skillet. It is a family friendly, crowd pleaser and perfect for serving with a big bag of chips or over rice. Brown the ground beef in a large skillet over medium high heat until it is no longer pink. Drain the grease from the skillet. 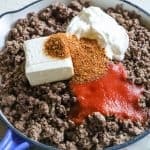 Return the skillet to the stove over medium heat and stir in the taco seasoning, tomato sauce, tomato paste, sour cream, and cream cheese. Continue to stir until all of the cheese is melted and everything is well combined. Let cook until the edges of the mixture start to bubble. Turn the heat off and stir in 1/2 cup cheddar cheese. Remove from stove and top with shredded lettuce, tomatoes, and the remaining 1/4 cup cheddar cheese. Serve warm. Enjoy! I haven’t tried any of your recipes yet, but I am going to. 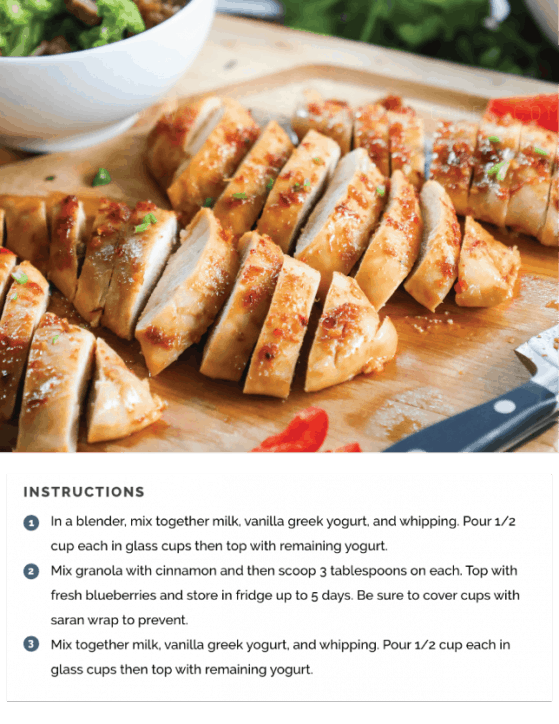 They look delicious and i love getting new recipes every week. 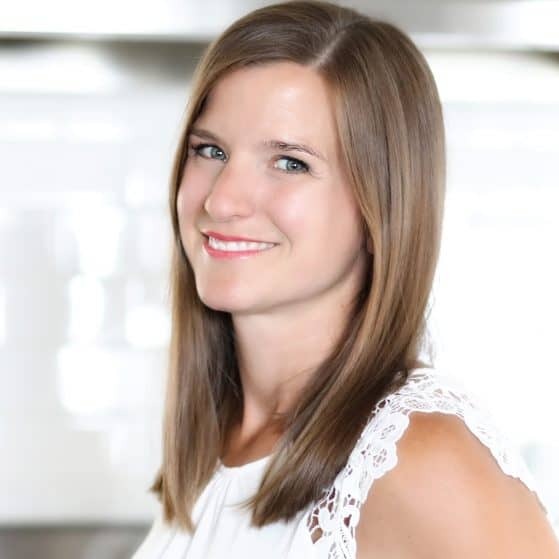 I like to cook, but I get tired of the same old meals, so keep the recipes coming! I think I am signed up for your weekly recipes, but could you double check for me, I want to make sure I don’t miss any! Read this recipe this afternoon & my husband & I just enjoyed this for dinner. This recipe is a keeper!